Why would I, a physician, stop to discuss the act of forgiveness? Mind-body medicine focuses on the interaction between the mind and the body and the powerful ways in which emotional, mental, social and spiritual factors can directly affect health. Letting go of the past was one of the hardest lessons I have had to learn, yet it is a practice I need to connect back to often. Are you starting to shift in your chair uncomfortably just thinking about forgiveness? When I discuss this stage of healing in lectures or with my individual clients, I hear deep sighs. Then I hear the response I used to give myself, "Yeah, but..."
"Yeah, but you don't know how unfair my ex-boss was to me." "Yeah but you don't know how long it took to diagnose my medical issues." We can all sit and share our "yeah, but" stories, but where does it leave us? Stuck in the past. I learned personally when we hold onto a grudge, we only fan the flames of our own anger. When we hold onto anger, it fuels resentment. When we are resentful, we halt forward progress in healing both personally and professionally. When we forgive, we allow ourselves to move forward despite our pasts. Feeling bitter interferes with the body's hormone and immune systems. Bitter and angry people have higher blood pressures and heart rates, and they are more likely to die of heart disease and other illnesses. Research also shows people who harbor resentment from an inability to forgive are more likely to suffer from depression. Physiologically, when we feel negatively towards someone, our bodies instinctively prepare to fight that person, which leads to changes such as an increase in blood pressure. Feeling this way in the short term might not be dangerous -- it might even be helpful to fight off an enemy -- but the problem with bitterness is that it goes on and on. When our bodies are constantly primed to fight someone, the increase in blood pressure and in chemicals such as C-reactive protein take a toll on the heart and other parts of the body. Studies at Duke University show that having feelings of resentment are as dangerous as smoking in risks for heart attacks and stroke. Resentment is defined as indignation or anger about having been treated unfairly. It is a complicated emotion because it involves feeling humiliated, shamed and sometimes wanting revenge. We have all been there, waiting to see what "karma" would bring the other person. Rumi's wisdom is the often hard to swallow anecdote: "If you dig a pit for others to fall into, you will fall into it yourself." By its very nature, the reasons for feeling resentful cannot be forgiven. In intimate, family relationships, love among people is broken. Feeling such a negative emotion often stems from feeling unseen and misunderstood by the other. It does not matter how trivial or serious the injustice might be. To the one who feels they are being treated unfairly, it's all the same, whether something slight or major. 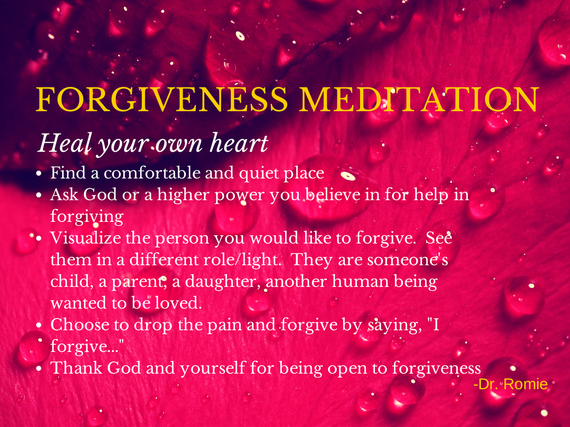 I am sharing a forgiveness meditation I teach to clients in building compassion for others through forgiveness. Do this meditation daily for at least 21 days. Journal the feelings that come up, and hold the intention that forgiveness will be in your heart. Romila "Dr. Romie" Mushtaq, MD, ABIHM is a traditionally trained neurologist with expertise in the field of mind-body medicine. Dr. Romie helps clients connect to inner peace despite life's external chaos as a physician, professional speaker and certified life coach with her Mindful Living Program. Dr. Romie writes at www.brainbodybeauty.com, where you can sign up to join her mindful living community and learn more about the medicine behind mindfulness. As a board certified physician in Integrative Medicine, She heals clients at the Center for Natural and Integrative Medicine in Orlando, Florida. You can follow Dr. Romie on Twitter, Facebook and connect with her on LinkedIn.